STAY AT HOME MOM: WW #50 - "First Bike Ride"
We broke out the bikes this past weekend. 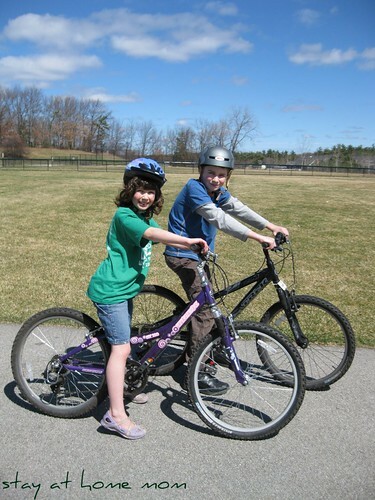 The kids loved having their first bike ride of the year. They have wanted to ride them practically every day since. Especially my daughter, she wants to ride it as much as she can. Me being the overprotective Mom, though gets paranoid and nervous of them on the bikes. I'm trying to get over it! Looks like fun and a beautiful day for it! You have seriously active kids. They are always out doing something. It's wonderful. Happy WW! I spent a lot of time on my bike as a kid. Great way to get around. Looks like a beautiful, warm day! Excellent exercise. I should try it. I am about to join the local gym. I like the tread mill best. I'll leave the bikes to the little ones. what great fun and exercise! I can't wait to do that again! I cannot wait for bicycle time. We had snow yesterday and today, so it might be a while. I don't think you ever really get over being an overprotective mom. My goal is to just get better at hiding it so that I don't stifle my daughter. I love bike riding. So fun. All the fun things spring brings. Yay!! Looks like a lot of fun. Glad to hear that the weather is getting better for you. It looks like a beautiful bike day. My kids like to ride too. I hope everyone enjoyed their day. They look so happy and free! Bike rides are so fun. I bet you had the best day! I enjoyed reading your blog. Very nice! Looks like fun! I need to get our bikes out soon. I remember how crazy and careless I was when I was a kid riding my bike. I'm not looking forward to that either. I wish it was warm enough here for our little one to ride. I am not even sure I remember how to ride a bike!! lol! What a gorgeous day for a bike ride! How fun!! By the way, I have an award for you on my blog! Our bikes were stolen at our old place. I'm hoping to get some this summer... can't wait! Yipeeee! For Bike weather! We love it!